The statistic includes only the Old City area – which means the full numbers are much worse. Jerusalem is under a full-blown massive terror onslaught – or “intifada,” as Arabs call it – official statistics prove. The statistics were compiled by the Ministry of Construction and Housing, which operates a security service in the area known as the “Old City Basin.” The area includes the Old City quarters inside the city's ancient walls, as well as the Mount of Olives, the Silwan (Shiloah) neigborhood and the City of David. The numbers for June and July indicate an average of close to ten terror attacks per day in this part of the city. The statistics, which were published in Yediot Aharonot Wednesday, do not include terror attacks in the city's eastern villages and neighborhoods, and this means that the full numbers for Jerusalem are much worse. In June and July, a total of 580 terror attacks were documented, against both civilians and security forces. These included 477 rock attacks, as well as 28 firebomb attacks against vehicles and homes in which Jews reside. Additional incidents involved throwing empty glass bottles, firing fireworks and damaging property. The terror attacks in June peaked at 359, of which 213 were in the City of David sector, 125 at the Mount of Olives and the mountain ridge, and 21 in the Old City. They include 307 rock attacks, 12 firebombs, four cases of grave vandalization at the Mount of Olives, and six attacks against Jews in the Old City, five of them against civilians and one aimed at a Border Police warrior. The total of recorded terror events was down slightly in July, at 221. 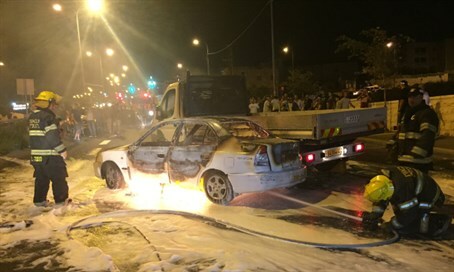 They included 170 rock attacks, 16 firebombs, one grave desecration, four incidents in which Arabs threw glass bottles at Jews, and several fireworks attacks. The Jerusalem Police said in response that its “resolute” actions against terrorism led to a decline in terror attacks in the last few months, noting that most of the attacks are carried out against security forces, because of the ongoing friction between them and lawbreakers in eastern Jerusalem.